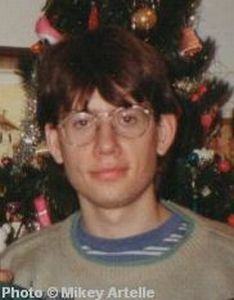 A handsome Christmas photo from 1994 when I was 21. Although being gay hasn't been easy for me, I am very proud of how I endured and persevered over the years. The struggle has knocked me down a number of times, but I always, always get back up. I'm not made of Teflon or steel, I'm just very stubborn which in this case is a good thing! 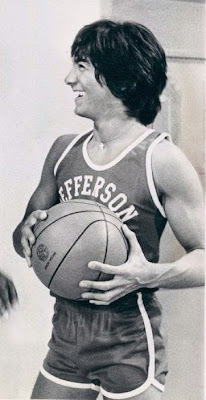 When I was very young and came to understand the social and political situation that goes along with being a gay man, I also eventually realized that while I may not have been given the choice to be gay, or the choice to be in a Catholic school, or the choice to be in this specific predicament, I knew that the choice to always get back up again after being knocked down was something that nobody else could decide but me. And here I am, a stubborn, shy warrior still standing. For that, I give myself a big gold star. Without question there were times when I didn't get back up right away. Sometimes it's necessary to be patient with yourself and take the time to think things through, find some support and talk to someone. But I knew that I would get back up again when I was ready. I refuse to let those who poisoned my young mind win this battle, so I will always get back up. Not only is this a promise that I made with myself, but it's also something that I owe myself. After all, it's rather silly to be down about others treating you with disrespect if you aren't going to treat yourself with respect either, so I owe it to myself to always get back up. It's quite remarkable that society today has changed so drastically from when I was a child. There is an entirely different outlook towards homosexuals now that is positive and supportive. So while it's easy to stay stuck in the same familiar mindset of the past, the truth of the matter is that today I also have the choice to move on and leave all that unwanted negativity behind. I can choose to replace those feelings of shame, self-hate and anger with positive feelings of pride and self-love for who I am. Quite simply, I cannot continue to let the negativity of those who are anti-gay determine the extent to which I can live a life of happiness. That is my choice to make, not theirs. Furthermore, if someone is anti-gay or homophobic and they make derogatory comments (such as gay jokes or pretending to be gay for laughs) I know now that such comments have nothing to do with me. I'm not the ignorant one, and I am not responsible for someone else's ignorance, that is all on them. Someone else's ignorance has no reflection on me. Looking at things this way, I can see how such derogatory words or attitudes are completely separate from me. Of course, there will be times when I'll speak up for myself, but I will pick and choose my battles rather than let others choose them for me. Clearly, I needed a lot of time for my own journey, but I can now say without any fake pretences that I like being gay and I'm happy that I'm gay! It's part of my unique personality. The lessons that I've learned from my struggle to accept being gay have made me a more compassionate person. If given the choice today between being gay or not I wouldn't change a thing... guys are just too cute! ;) I'm proud to be gay, and if you're a gay guy like me, I hope that you're proud too! Carry on brave warrior! Onward and upward! Here I am with all of my hand-made superhero puppets in March 2016 when I was 42.